An opinion of sprint triathlon I heard some years ago at a club meeting was “Swim till you feel ready to puke, Bike till you feel ready to puke and then Run till you puke“. I hadn’t done a sprint distance triathlon in over three years so this past Sunday was a re-acquaintance with this interesting quirky little race distance. the guy on his mountain bike giving the sport a try for the first time, we like him! the seasoned M-dot guy with the £5K bike, we like his bike! the guy grabbing a fag on the way to the swim, we guess he is also just starting out. Like I said all types, all taking part in a great sport. For my part, I was not especially wanting to be there. But I had decided it would be a good training event, and a way to remember what transition looks like. My wife and girls had already decided looking at some of the field that I ought to win the race (it was a threat). This was because I had dragged them out early on a Sunday morning, to [quote] “not even swim, bike and run that far” [end quote](! ), their expectations were also based on their appraisal of some of the field. I wish it were that easy! – one day perhaps. I am not a sprint triathlete at all I am afraid. I don’t do interval training in swim, run or cycle. All my training is long course, and I have very little time to squeeze in a little weight work. Not the stuff sprints guys are made of. Plus an overly modest indulgence of vino the night before, did not bode well. The swim was a bit of non-challenging 400m pool swim(! ), in the local well maintained Leisure Centre. For the swim you are required to give your estimated time, to allow for the formation of waves. My modest 6’20 estimate (I go faster when I try) placed me in the second to last wave, with some fairly serious looking guys in fancy trisuits and expensive Zipp clad bikes next to my humble machine in transition. I told the wife and kids not to expect too much and that I would be going for survival. My family seem to know better because they didn’t say anything, and only nodded and smiled, I learnt this later. Ran to the bike from the pool with no problems and began going into my normal transition mode. That is grab socks, gloves etc. I quickly saw this would be a mistake these sprint guys work in hyper speed, and not at the long course pace I have got used to. So I ditched the gloves and other time wasting and went out to Race! 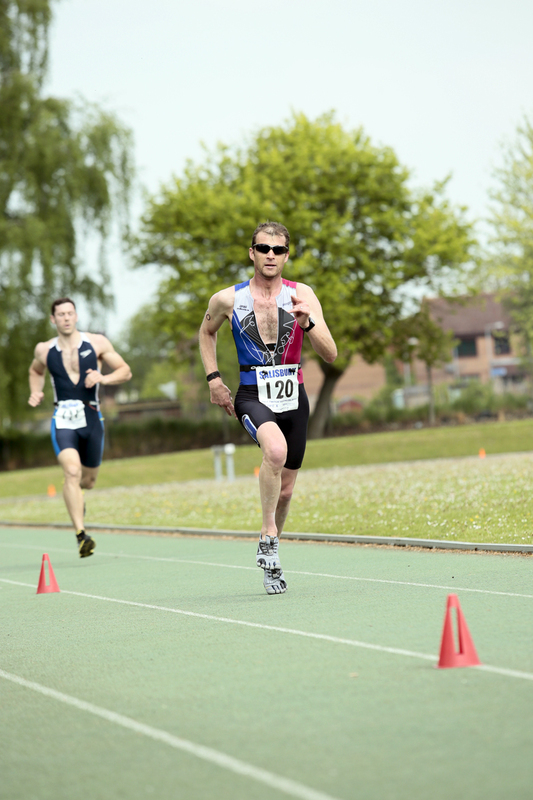 I hit the bike at a steady pace, again this was wrong, in the sprint tri it needed to be all in from the outset. The distance is very short so if you intend to be a front running contender adopting half IM pace is not the way. I lost a couple of places initially before ramping my effort. I found that some of my fellow competitors seemed inclined to cheat a bit and drafted their way up to me at around the two thirds mark, and then sat on my wheel. A bit offsides, but we’re wise to this now. At the bottom of the only Cat 5 climb on the course they decided to spring as I had expected. Halfway up the hill, I decided to hit the afterburner and go. This worked well, it was only on the flat that I had company again briefly before I hit the afterburner hard again and took off. At one point I thought it was raining, until I figured out it was perspiration on the inside of the aero helmet. I got off the bike with about a minute ahead of my nearest competitor. The ride into Salisbury had been a little hair raising since the early Sunday morning sleepy town was now fully awake, and certain South African triathletes were flying through said town at 40+ km/h dodging parallel parking seven seaters. The dismount line was perhaps bit unclear, and I believe more than one athlete had fallen slowing down too quickly. One unlucky guy had broken a finger. I headed into transition and then started to fumble with my Vibram Bakila LS’s, these are fine for a long course as I will be using in two weeks time, and I wanted to practise running them in race mode. But for a sprint tri, I needed to be in and out in 30 seconds tops, but instead I fiddled for a good couple of minutes with my shoes. That allowed the competition to close the gap! I hit the run incensed at myself for undoing my hard work, and hit into a dead sprint grabbing my places back. The girls loved seeing Dad so fired up! The run course goes up a fairly steep hill, to a prehistoric fort found on the edge of Salisbury, and along the back in the country, all picturesque and very interesting. The ramped up pace of all of this took it’s toll, at the end of the foot race fighting for my place all the way, I was starting to hold off the need to puke feeling (see opening paragraph). Carrying 1 litre (1Kg!) of water on the bike, completely unnecessary, cost? I have to say it was good to be out racing! I can’t wait for the ‘A’ races, which I really hope go well. In my opinion this was a good race to do as the start of the season and I need to say thanks to the squad for penning it in as an event. I’ll definitely start next year’s season with a short event as soon in the year as possible.